Monster Truck Madness – Remembering “The Claw” « Big Squid RC – RC Car and Truck News, Reviews, Videos, and More! The 80s and early 90s were a magical time for young monster truckers like myself. In addition to various TV programs and cartoons featuring the rigs, there were some truly awesome toys made available in this era, be it die-cast, battery operated or remote controlled. Being a kid that was absolutely obsessed with monster trucks, I pretty much got my hands on all of them at some point. From time to time here, I plan to take a look back and highlight some of these awesome offerings for those of you that have a similar nostalgia for this stuff…and to give some of you younger whippersnappers the what-for. 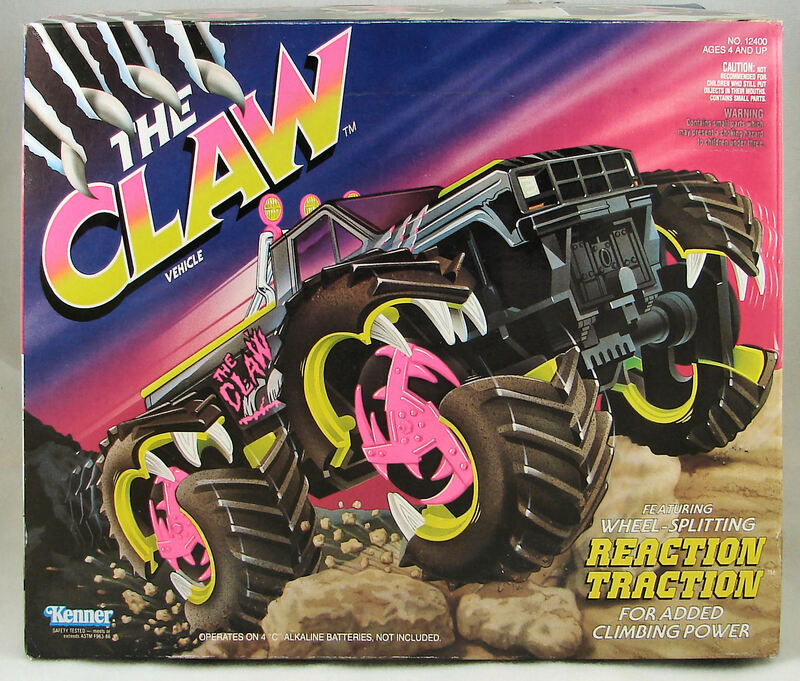 We are going to start with a toy that was one of my personal favorites, “The CLAW”. 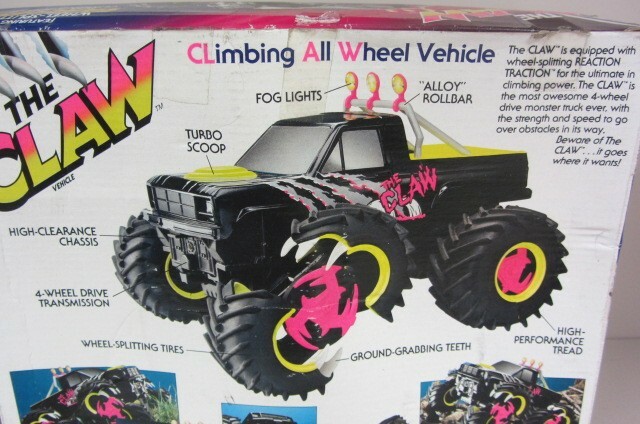 The CLAW, which stood for Climbing All Wheel Vehicle was released in 1991 by Kenner Toys. I pretty much died when I saw the commercial as a 7 year old. I absolutely HAD TO HAVE ONE. I mean come on, how can you resist this? I wound up getting the truck for my birthday, the black and neon yellow/pink version shown in the box pictures here. It was even drawn on my birthday cake! Suffice it to say, I beat the crap out of that truck. Ok, so “most awesome 4 wheel drive monster truck ever” was just a tad hyperbolic, but the truck still was pretty cool. The “Reaction Traction” was actually a real thing, as whenever the truck would start to bog down, the wheels would open up exposing the claws and it would actually climb pretty well. It was a ton of fun climbing gravel hills and makeshift living room obstacle courses. The motor or gears (can’t remember which) eventually gave way after the 100th tug of war with various other trucks of mine. It lived a good, albeit short, life. These trucks weren’t super popular back in the day, nor are they really worth much now (a quick eBay search shows that they can be had for under $20.00) but that doesn’t stop me from looking back on it as one of my favorite toys. Do you folks have any memories of The CLAW? I’m hoping that one of these days I can bring the spirit of the truck back alive with a tribute paint job on one of my solid axle r/c monsters!